Yamaha, the Japanese brand steals the show at EICMA 2014, Milan by unveiling their YZF-R1, which is designed to take your riding experience to a next level. The bike derives its components from Yamaha’s MotoGP machinery. The Yamaha 2015 R1 is powered by a four-cylinder, 998 cc inline engine with twin fuel injectors per cylinder, along with a 4-valve crossplane crankshaft developing 200 PS (197.1 bhp) at 13,500 rpm and delivering linear torque output of 112.4 Nm at 11,500 rpm without ram air induction. It weighs 199 kg (fully fueled) which is 8 kg lighter than the older R1 and has an astounding power to weight ratio. It has Lightweight forged aluminium bridge-box pistons. Titanium fracture-split con rods which are a lot lighter than steel (around 60% lighter). The length, width and height of the new R1 are 2055 x 690 x 1150 mm respectively. It has a wheel base of 1405 mm. It has Large fuel tank capacity of 17 litre which is quite voluminous. Large diameter valves and high efficiency intake ports, 2-directional 12-hole injectors, Offset cylinder design. High efficiency centralized lubrication system. Titanium 4-2-1 exhaust with midship muffler and new exhaust valve. Piston pins with diamond like carbon (DLC) coating. Low-tension piston rings to reduce internal friction. 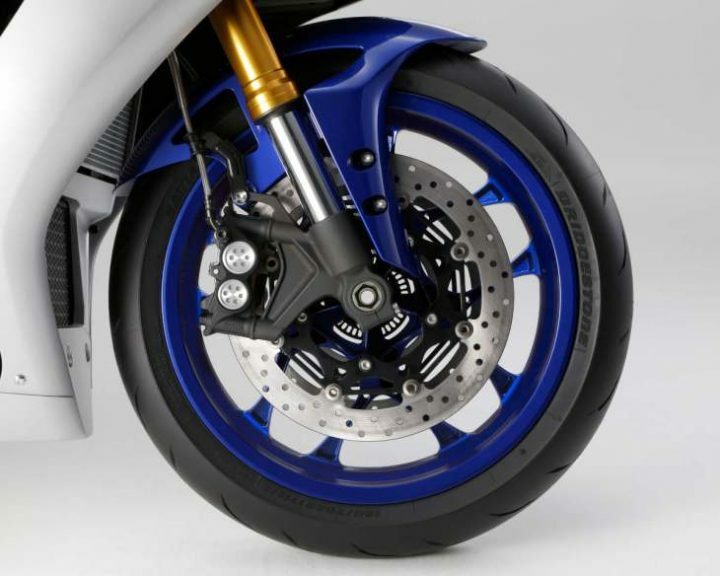 The clutch is new, 7 percent smaller in diameter and 19 per cent lighter than the current R1. The front tyre specifications are 120/70ZR17M/C and rear tyres specifications are 190/55ZR17M/C. The bike has ABS as a standard fitment. This bike is equipped with Electronic Racing Suspension (ERS) that provides additional stability while making adjustments to front and rear suspensions both, aiming at experienced and professional riders. It also includes Slide Control System (STS), Traction Control System (TCS), Front Lift Control system (LIF), Launch Control System (LQS), Quick Shift System (QSS), and Yamaha Ride Control system (YRC) etc. 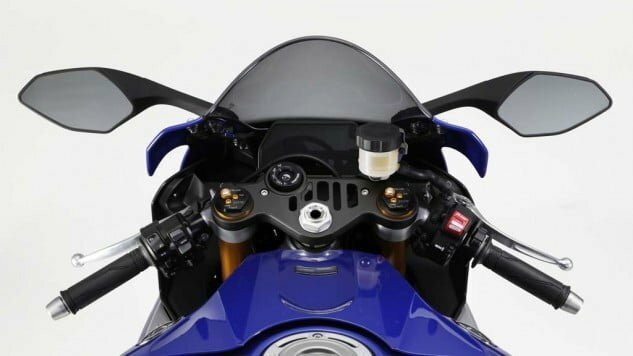 The new R1 will compete in the market with BMW S1000RR, Aprilia RSV4, Suzuki GSX-R1000, Honda CBR1000RR, Kawasaki Ninja ZX-10R. The all-new 2015 YZF-R1 is fast, safe and looks exceptionally good. It will be available in three color options: Rapid Red/Pearl White, Team Yamaha Blue/Matte Silver, and Raven. The bike is expected to be available in markets till February 2015 at the price of $16,490.